A new installment of the popular football series. The developers introduced various new additions to the gameplay, added new licenses and reworked the MyClub mode. 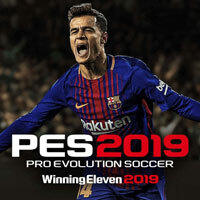 Pro Evolution Soccer 2019 is a sports game from Konami which is a new installment of the popular series developed from 1996. The game is a continuation of Pro Evolution Soccer 2018, and offers improved mechanics. The gameplay mixes arcade and simulation elements. When it comes to new additions, the game offers a reworked MyClub, which contains, among others, new way of contracting players and special versions of the players released throughout the whole year. Thanks to eleven new traits, additional animations, and new additions to behavior and looks of the players, the players received increased individuality. Moreover, the manager mode received three major changes – pre-season ICC tournament, more detailed transfer system and new licenses. In opposition to previous installments of the series, where Konami used UEFA licenses for Champions League and Europa League, Pro Evolution Soccer 2019 do not contain these leagues. New league licenses were added instead.